We’ve taken that knowledge to develop the EY 7 Drivers of Growth so we can help all businesses with high-growth aspirations gain that broad focus and successfully execute their growth strategy over the long term. 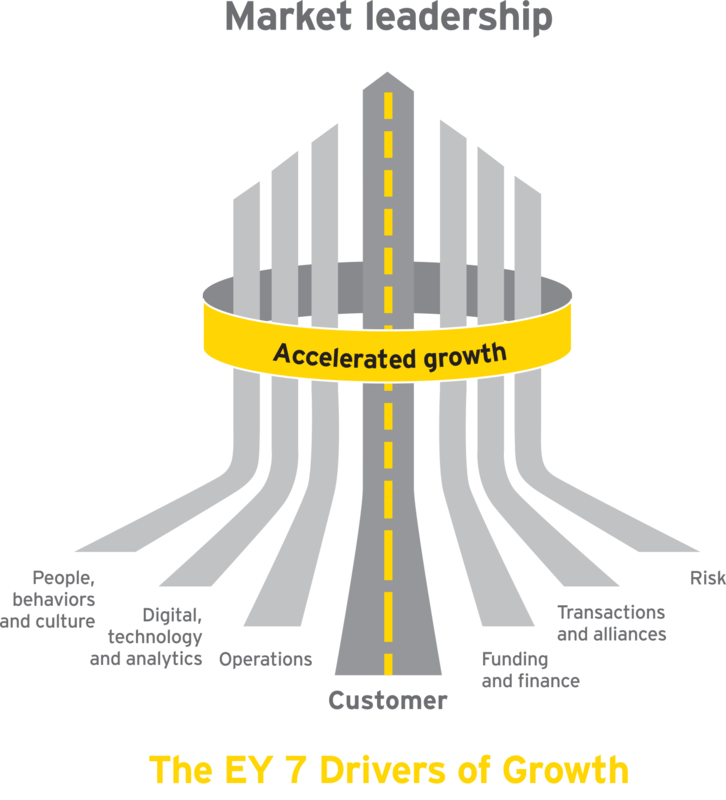 We use the EY 7 Drivers of Growth to help leaders of aspiring companies think differently about the enablers of growth. Looking at these drivers can help business leaders assess where they are today and plan the right path forward to accelerate growth. From the outset, leading companies make customers their focal point. They understand that by putting customers’ needs and desires first, they can achieve a competitive advantage. They know all about their customers — who they are, what they want and when they want it — and they know that building customer loyalty goes hand in hand with long-term sustainable growth. Even after becoming market leaders, these companies are constantly thinking about how to keep engaging and delighting their customers in all of their markets. Any organization is only ever as good as the people working for it. To win the war for talent, leading businesses build an environment that values diversity and attracts and retains the right people to help grow their businesses — not just great people, but people who share the company’s vision and fit its culture. Leading businesses provide strong leadership and create an inclusive environment where differences are valued and people can innovate to drive the business forward. On top of this, they invest in their employees, nurturing their talent and helping them develop skills to match the demands of the business during each different growth phase. For business leaders, information is power. It can help them make better, quicker and smarter decisions that improve business performance and manage risk. Digital technologies – including social media, the cloud, data analytics and mobile – are having a profound impact on businesses across all industries, from retailers and banks through to carmakers and energy companies. They are fundamentally changing the ways consumers interact with these companies, while also opening up new business models. The digital enterprise presents the opportunity for CIOs to have a bigger and more influential role in the business. If organizations harness the power of information technology, they can create a strategic and competitive advantage. Yet, while many C-suite executives and IT leaders recognize this potential value, many still find it hard to successfully leverage information technology to deliver business change. Your operating model is the link between your strategic intent and the ability of your organization to deliver on that intent. Having a clear approach that aligns your operations with your strategy will increase your ability to achieve success. Market leaders consider all aspects of operations at a macro and micro level. Focused on the details, they understand that every aspect of their business must hold up to scrutiny and be constantly improved to stay ahead of the pack. Leading companies leave nothing to chance. Instead, they take control by analyzing their operations and ensuring that all parts remain at their most effective at all times, making changes when needed. Global companies leverage supply chains effectively to optimize costs and enable growth. Their leaders are focused on achieving greater agility and responsiveness to deliver superior results. All businesses need funds to grow. How a business manages its money – and its new investors – will determine its course for the future. Leading companies determine the best financial solution – or mix of solutions – for their business and derive maximum benefits from their management of available funds. To achieve this, CFOs and the finance function have to act more strategically and more commercially, improving performance by delivering insights to decision-makers. This role has typically been described as business partnering, with the CFO acting as a catalyst or value integrator. Leading companies use their CFO as an economic advisor. This leads to improved financial performance. Market-leading companies rarely evolve by organic growth alone. To rise to the top, they seek successful partnerships and strategic acquisitions capable of enhancing their growth, competitiveness and profitability. Leading businesses, while quick to grasp the value of transactions and alliances in today’s dynamic markets, also appreciate that landing the right deal is not about luck. They make a concerted effort to remain alert, to build profile in their markets and to ensure that they’re well positioned to seize an opportunity as soon as it arises. While this is simple in concept, the journey can be difficult. There are many pressures that affect the ability of a business to achieve its goals. Having a plan – aligned with your strategy – to address known issues proactively and react to future pressures will increase your ability to achieve success. This driver has a broad remit, covering all the fundamental business challenges a growing company faces, across recruiting the best people, policies, procedures and compliance as well as stakeholder management. To succeed in today’s fast-moving climate, senior executives must have a strategic approach to risk management. Regardless of a company’s stage of growth, the ability to identify and manage risk stands out as a vital element of success. Companies that wish to become market leaders should not fear risk. They should approach it intelligently to reap its rewards and accelerate their growth. EY Velocity is a global digital platform helping founders, CEOs and leadership teams of established start-up and scale-up businesses make informed decisions and reach better outcomes faster.